‘National Treasures’ has been named among the finalists for the 2019 C21 International Format Awards. Produced by Irish Production Company EZ Films’ for RTÉ, ‘National Treasures’ has been selected for the Best Multi-Platform 2019. More than 270 formats were entered this year, with ‘National Treasure’ to only Irish representative of the 57 that made the final. ‘National Treasures’ explores the social history of a nation by uncovering the fascinating objects in the hands of its citizens at a series of roadshow events. Driven by a web-platform, audience participation, and user data, this inclusive television format brings audiences to the fore to explore their stories, their objects, and their history. 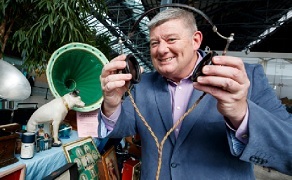 The innovative format - created by Irish production house EZ Films in partnership with RTÉ and the National Museum of Ireland - sees a team of curators selecting objects for an upcoming exhibition, not based on the monetary value but rather the historical/cultural value that they hold. ‘National Treasures’ is produced by EZ Films (‘Man on Bridge’) for RTÉ in association with the National Museum of Ireland and the Broadcasting Authority of Ireland. Nordic World handles the sales of the format. The winners will be announced at the International Format Awards Gala Dinner, which takes place at ClubC21 on Saturday, April 6 during MipFormats. The International Format Awards are a co-production between C21Media, Frapa, EMC, and MipFormats.